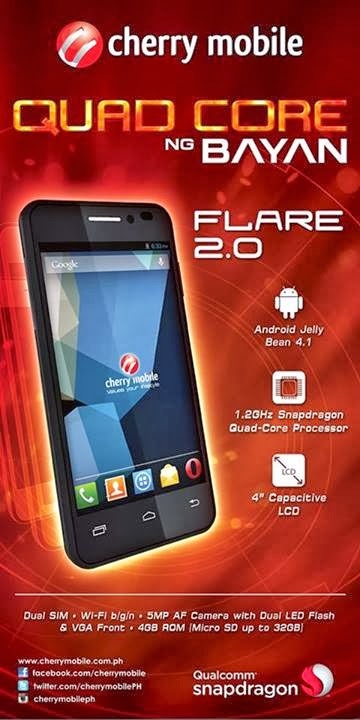 Cherry Mobile officially launched the most awaited game changer phone Flare 2.0, it has a suggested retail price of 3999 pesos. A follow up to their number hit "Dual Core ng Bayan" now comes with upgraded processor powered up to quad core. It also has a renewed stock Android Jellybean OS out of the box feature, which I think smoothen with the help of 4x processing power. Still running on a Snapdragon family, these time it’s on Qualcomm 8225Q quad core CPU. To those who are planning to buy this phone you may check these specifications provided below for your reference. On the other hand, you may wait for a few weeks ‘til you can get a source of full review on this handset at is still fresh for now. 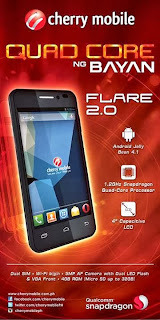 This is a worth upgrade of your old Cherry Mobile Flare for the price of P3999. One of the most affordable quad core smartphone in the market today that can handle calls, texts, browsing, social networking, business apps and other lightweight task. As what Cherry Mobile Flare users aching before, they should patch up the battery life of this version 2 to gain good impression from the previous Flarenatics.